Triggers and automations in Zendesk are collectively referred to as business rules. They perform automatic actions to update tickets, notify users, and organize your work. In your Zendesk, business rules can affect all tickets, or you can use conditional statements to include or exclude specific sets of tickets. 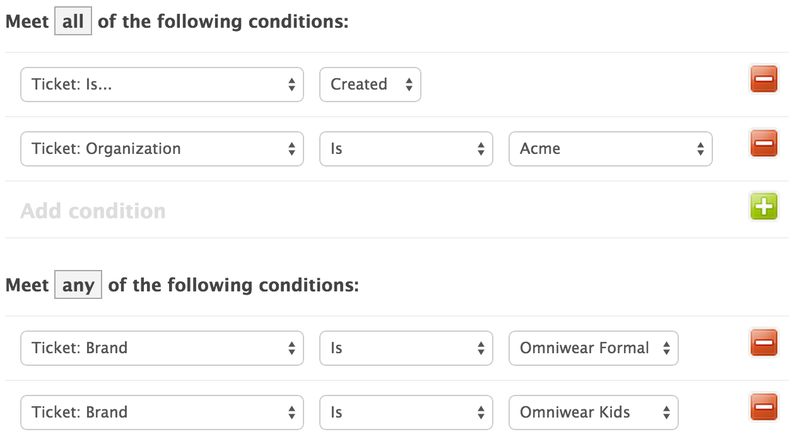 So, if you support multiple brands in your Zendesk, you can design triggers to affect tickets from a specific brand (or exclude it), just as you would use triggers to affect tickets from a specific organization (or exclude a specific organization). In short, you have only one set of triggers. This article will show you how to create brand conditions for triggers. You might want to exclude a brand or multiple brands from a trigger. For example, if you have a trigger that escalates priority of tickets for a specific customer organization, you might want to raise the alarm for only one specific product. Maybe the customer paid for a higher degree of service for one product, but not all, so the priority escalation should happen for one brand only. For this purpose, you have a number of options. Triggers aren’t tied directly to brands, but you can use conditions to scope by brand. It's possible to use business rules (ie: triggers and automations) to update the brand on your tickets, but it might be easier to use the bulk ticket update feature. Each page of your view will show 30 tickets, but you can select all the tickets on one page, then move to the next page and select more. In this way, you can bulk edit up to 100 tickets at a time. Do you think that would work for you? Hi - When you do the migration from running hub-spoke to becoming multibrand, will the trigger and automations be divided up automatically by brand by the system, or do you have to do that manually? I apologize for the late reply. Unfortunately, triggers and automations will need to be recreated manually. There are going to be small changes here and there that will cause many of the triggers and automations to no longer fire properly. Rather than force you to troubleshoot these after the fact, we have you manually configure triggers for the new brand. This way there is a better chance that everything will work properly afterwards. How to limit the agent to modify the brand of the ticket? Just a quick clarification: do you want to prevent agents from changing the brand on the ticket? Or were you looking to do something else?